However, better-than-expected reports on industrial production and empire state index coupled with tame CPI numbers helped to offset the decline. Meanwhile, an US$858bn package of tax breaks and an unemployment-insurance extension sailed through the Senate yesterday. Investors are now looking for Congress to extend the Bush-era tax cuts. On Wall Street, strengthening economic data and a low VIX around 18 could signal that a lot of bad news has been discounted. In our view, this will drive the Dow towards our envisaged technical resistance levels of 11700. Immediate support levels are 11000-11200 points. 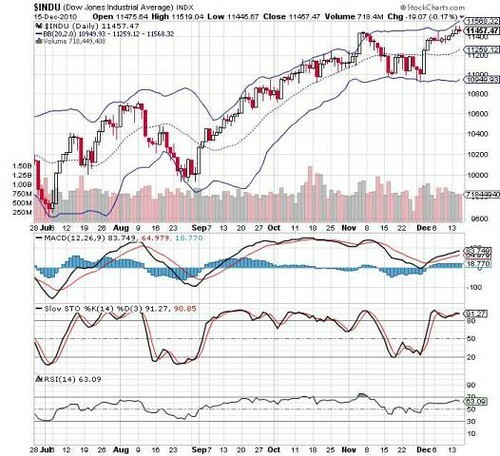 Dow Jones shows strong resistance at the uppper bollinger band.